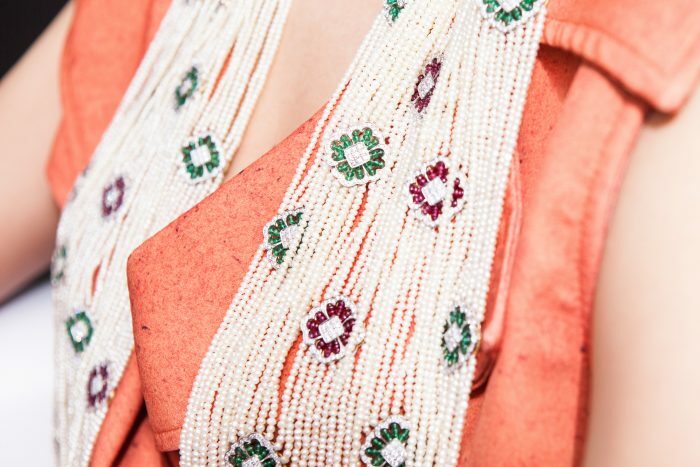 Take a look at this unique pearl scarf. It’s 500 grams of natural pearls! Something I discovered while in Bahrain at Mattar Jewelers, a leader in the natural pearl trade. The Mattar Scarf is a wonder to behold. A passionate endeavour, considering it would take a lifetime to collect this many pearls of the same size and colour. But Mattar Jewelers has many years of collecting light cream, Nibati pearls and have created a one-of-a-kind pearl scarf. Offset with 78 carats of rubies, 80 carats of emeralds and 62 carats of diamonds, it is just priceless. Absolutely breathtaking and an honour to wear. Never been done before, this pearl scarf was something of a challenge because there are only 25 pearls of commercial value for every 10 thousand oysters. To find so many matching pearls of this quality is almost impossible, but Mattar Jewelers pulled it off and knew they had to make something magnificent, and above all – unique. A masterful design, the pearl scarf had to be light enough to be comfortable to wear. Just the stringing of the pearls alone took 72 hours. The Mattar Scarf is a true treasure. To get into the spirit of Bahrain, I am wearing 30 meters of pearls in my hair and my face is made up with blue flowers. It’s my take on the dress code among Saudi guests during my visit to Jewellery Arabia.